Photo of the John Gorka Band was made by Mona Waldrep (copyright AIX Records.). ..................... Ray Disc page of AIX records (Price: $34.98). Click here if you want to read a review in "Playback"
The main creative project at the moment is a DVD which should be out this summer. "The final format is still being worked out but I can tell you it will be very high quality video and audio. 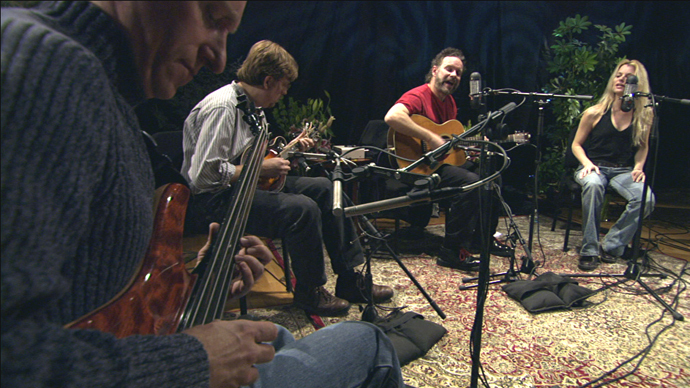 The main part of the DVD is a performance of 19 songs recorded live without an audience at a theatre in Los Angeles. The players and singers include: Michael Manring on bass, Russ Rentler on mandolin, Amilia Spicer on vocals, and Susan Werner on guitar, piano and vocals. I’m in there as well playing and singing as you might expect. I will post the set list when that is finalized. The DVD is entitled “The Gypsy Life” and the band’s working name is “The Godfrey Daniels Spasm Band”. .. . . . . . . . . . ... . . . . . . . . . ... . . . . . . .. . . . John Gorka . This is another in our series of Collectors Editions..comprised of two discs, deluxe packaging and hours of great music and video. There is a Dualdisc [CD and DVD-Audio] and 2-sided DVD-Video disc. Featuring footage of John performing in concert at McCabes in Santa Monica, rehearsing with his band here at the studio, music videos, John discussing the songs and his life and much, much more. There is no bigger fan of John than myself and this project delivers it all. One listening session and I'm very confident that you'll be a fan too...if you're not already. I've had a chance to watch my copy of The Gypsy Life a few times now, and not surprisingly, I think it's great. When it arrived, I put it in my DVD player thinking I might watch the first song or two because I was planning on doing something else that night, but I ended up watching the entire 2 hours! At first, I wasn't sure what to make of it. A little intro, then into the first song. I'm glad that later on in the DVD they started mixing rehearsals, old videos, performances and general banter, it gave it a little more personal, behind-the-scenes feel. I wish I could say that John knocked every song out of the park, most I think are great live versions, a couple maybe not his best efforts, but hey, he's a human being and even his worst moments are about a 1000x better than I could manage. One added benefit to this video that I hadn't thought about is how it could help me learn some parts of his songs on guitar. I've learned most of Italian Girls by watching his fingers, and I can do a pretty good copy of it now. I'm glad he added Russ Rentler to the mix, besides making it feel even more personal with their friendship, I happen to really like the sound of the mandolin. Overall, this part of the DVD is impressive. Great sounding on my surround sound system! I have the CD of the performance in my truck, so I can sing to my hearts content and not bother my family, it sounds good as well. I wish I had a DVD Audio player, I'd like to hear what that side of the DVD/CD sounds like. The bonus material is good with pictures and notes, but the best part of it is the extra videos. The show at McCabes is very good, you can see how much more at ease he is in front of an audience, than he is for the studio video. Overall an impressive addition to my Gorka collection. Sounds great, nicely packaged, I’m glad that AIX went out of their way to honor a guy who is a great musician, and as far as I can tell, a great person. 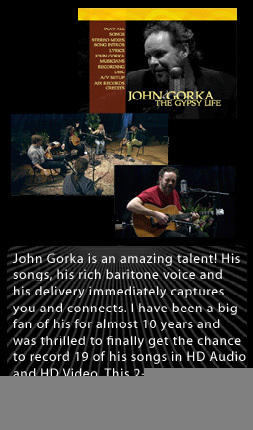 Listen to John Gorka: :.. 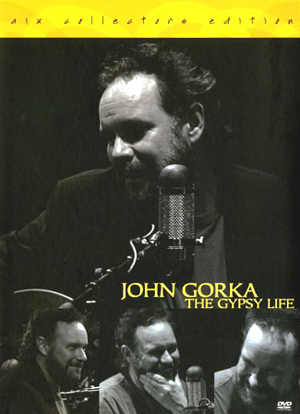 In the summer of 2009 AIX Media Group hope to release "The Gypsy Life" to the Blu-Ray format. somewhere near 2000 "The Gypsy Life" DVD's! !